Get ready to outwit, outplay and outlast some more "Survivor." CBS has renewed the reality competition series for two more cycles, to air during the 2014-2015 season. For those keeping count, these will be the 29th and 30th iterations of "Survivor." The network also signed a new agreement with Jeff Probst, bringing the Emmy-winner back as host and executive producer of the show. He's hosted "Survivor" since it premiered in 2000. 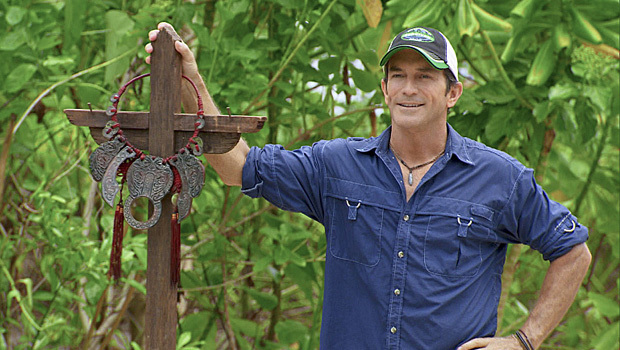 "'Survivor' has been blessed with incredibly loyal fans,” said Probst. "We make this show for them and I am thrilled that we get to do it again." Executive producer Mark Burnett added, "I am thrilled that our fans get to continue their love affair with 'Survivor' on CBS through 2015. This current season has become one of the most-loved seasons ever and I promise our fans to make season 29 and 30 even better." The current "Survivor" season, "Blood vs. Water," will come to an end Sunday with a two-hour finale beginning at 8 p.m. ET on CBS, followed by a one-hour live reunion show hosted by Probst. Tell us: Are you glad "Survivor" will be back?